A tea tasting at The Path of Tea promises to be a delightful and fun experience for everyone, from tea connoisseurs to tea virgins alike! In our Introduction to Tea Tasting class, you will taste six different types of tea: white, green, oolong, black, pu-erh and rooibos. You will learn the history of tea, its origin, health benefits and much more. Not sure how to prepare your tea? Or curious about the different flavors or names of a tea? This introductory class is the perfect setting to have all your questions about tea answered and gain some serious tea knowledge. We will share ways to brew the best tasting teas. We talk about the best water to use, how long to steep each type of tea and the optimal water temperature. As an added treat, each student will receive a 2oz. bag of tea to test their new tea skills at home! We promise you will go home a quasi-tea snob! 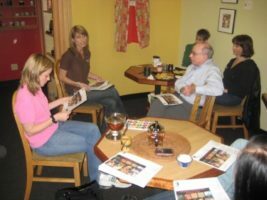 Tea Tastings are taught by Chris McKann, the owner of The Path of Tea. Chris has a wealth of knowledge, having participated in over 1,000 tea tastings over the past 5 years. Due to the fact that there is limited space for each tasting, you must CALL TO RESERVE your place at 713.252.4473, regardless of where you purchased your ticket. If you would prefer to buy your ticket over the phone or at the door, please call us at 713.252.4473. If you purchased a voucher from a “deal- type” service, such as Groupon, Living Social or Amazon Local, please call us to reserve your place for the tea tasting. All Wednesday night tastings are from 7pm to 8pm. P.S. We will honor your Groupon, even if it’s expired.